Synopsis: The summer after high school graduation, two cute and snarky boys hit the road in an RV. Their mission: follow the traveling fan convention for Castaway Planet, the cult sci-fi show they’re both obsessed with.BRANDON irons his t-shirts, loves the dapper and reserved Castaway android Sim, and hides his pesky Catholic guilt from his out-and-proud roadtrip partner, Abel.ABEL collects funny belt buckles, loves Castaway's brave and dashing Captain Cadmus, has a hot boyfriend with a phoenix tattoo, and has nothing to hide—except his epic crush on Brandon.During their six-week cross-country adventure, Brandon and Abel post new entries on their Castaway Planet fan vlog, spar with an online community of slash fiction writers, meet their TV idols, play with their action figures, uncover big secrets, and maybe possibly fall in love. Can two fanboys face down their obstacles and write themselves a real-life romance—or is fiction the only thing bringing them together? Two gay boys, Brandon and Abel, are strictly business partners when it comes to their sci-fi fandom vlogs, Screw Your Sensors. They spend most of their time debunking slashfiction theories about their favourite characters Cadmus and Sim; captain and android of Castaway Planet, but both have secrets. Brandon is slowly being eaten away by guilt from his Catholic upbringing; Abel drowns people out with his constant chatter and his inability to empathise. A 6 week roadtrip across America visiting all the Castaway Planet conventions could make or break their friendship. Core to the novel is undoubtedly religion and sexuality; a struggle that haunts Brandon, and anyone who’s ever been in a situation like him, for a long time. Like all books dealing with religion, there’s a danger that How to Repair a Mechanical Heart veers into the realms of religious stereotypes. Thankfully, Lillis manages to avert it just barely; as the novel starts packing its bags, there’s less of the annoying, bolded religious voice that intersperses Brandon’s narrative to begin with and more reconciliation and acknowledgement. It’s easy to present Christians as bible-thumping, gay-hating illogical baboons; it’s harder to faithfully and honestly understand how and why people believe what they do. We might be a little too quick to condemn the homophobia displayed by Father Mike and Brandon’s parents; but, as Brandon notes, “he’s not even a bad guy”. It’s these moments of sensitivity that really work in Lillis’ favour and move the novel away from the stereotypical Christian/gay paradigm and into less polarised waters. 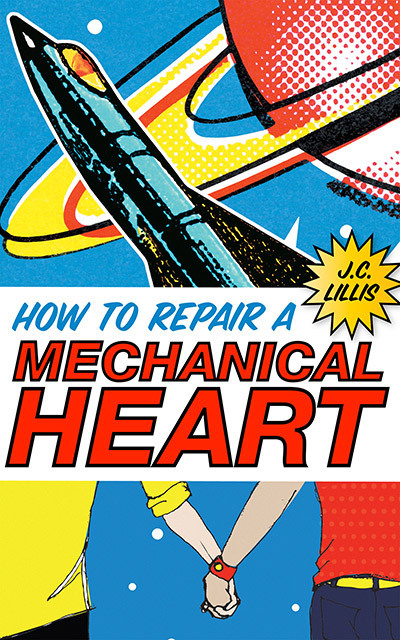 The story beats of How to Repair a Mechanical Heart are hardly subtle; like all rom-coms it favours the form of hook up / break up / make up, but if you’re reading the novel for its plot points, you’re in the wrong genre. What makes this novel is the touching characterisation: Brandon, struggling to unload his catholic guilt and Abel, who struggles to empathise with what he sees as something obviously destructive, harmful. Their romance is teasing, fun, if a little swift, as Brandon acknowledges, and their reconciliation almost had me in happy tears and forced me to listen to “Grow Old With Me” by Tom Odell. What Lillis has crafted here is a beautiful thing that can stand with such traditionally published novels as Simon vs the Homo Sapiens Agenda and David Levithan’s own body of work.